In episode 6, Janet talks about the bilingual teacher interview process and integrated units of students with a first-year dual language teacher. Janet: This is The Bilingual Profe Podcast episode number six. Today, we welcome a new bilingual teacher from Washington state. Stay tuned. The Bilingual Profe Podcast is for busy bilingual teachers looking to improve their teaching practices and classroom. If you are a bilingual, Spanish immersion, or dual language teacher, then this is the podcast for you. 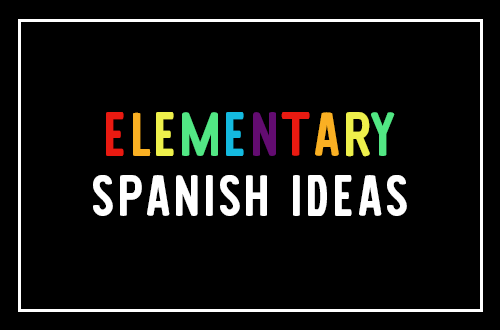 We’ll talk tips, ideas, and best practices for your bilingual classroom. Are you one of us? Come join the conversation at bilingualprofe.com. Janet: Hey there, welcome back to episode six of The Bilingual Profe Podcast. I’m Janet, the host of this show. Today, I have a great conversation with Isabel Lyons, a first year dual language teacher from Washington state. We talk about the bilingual teacher interview process, tips for new bilingual teachers and how to engage students with integrated units across subject areas. Janet: Today’s episode is brought to you by Profe Club. Do you feel overwhelmed translating and creating resources in Spanish? Do you want to regain your prep time and weekends now? 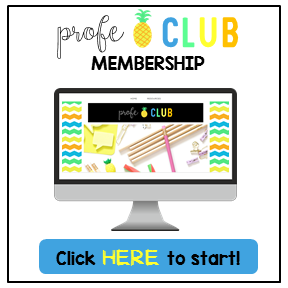 Join Profe Club and get instant access to over 300 resources in Spanish for bilingual and Spanish immersion teachers that will help you regain your free time and feel more prepared for class. Janet: Go to ProfeClub.com to try it now for only $5. Now let’s go to our conversation with Isabel. Thank you Isabel for coming on this show. Can you tell us where you’re from and what grade you teach? Isabel: Yes, I am from the state of Washington. I teach in Bothell which is just a little city over here and I teach third grade dual language. Janet: Okay. What kind of program? Is it a dual language immersion, bilingual? How does it work at your school? Isabel: Yeah, it’s a dual language program. The students are in a 50-50 program from kindergarten all the way up to fifth grade. Janet: Okay. You said you are which grade level? Janet: Third grade. They get half the day in Spanish and then half the day in English? Isabel: That’s correct. It is half the day, but it’s not like morning versus afternoon. It’s more split up. The language is split up by subject rather. Janet: Do you teach the same students all day long or do the student group switch? Isabel: I usually teach the students all day long, but for the past two months, I have been … The students have been switching because my partner teacher went on maternity leave. The [inaudible 00:02:56], they’re short at hand. For now, we’re switching, but usually I teach both the language in my classroom. Janet: Okay. Usually, it’s a self-contained classroom, but you’re flexible for a maternity leave? That’s perfect. Janet: How did you become interested in teaching as a bilingual teacher? Isabel: Yeah, well when, I knew I wanted to be a teacher when I was in high school. I started to pursue being helpers in elementary classrooms and my mother is from Nicaragua and I always grew up visiting Nicaragua during the summer time and I’ve just always wanted to in the future maybe live there for a couple of years. Isabel: In the back of my mind as I was reaching for my teaching credentials, I’ve always thought like, “You know, I want to be able to someday have the ability to also teach in Nicaragua and be able to teach in Spanish and maybe even at a bilingual program in Nicaragua.” That was in the back of my mind. Isabel: Right, totally. I think when I was growing up, my mom totally would have put me in a dual language program if she could have, but she didn’t know and I think that something else that really got me interested in dual language was that students who have Spanish at home, they don’t have to lose that. I think I really miss that as a child, I went to school in an English-only school and I really think that it’s just so valuable that especially our native Spanish speakers get to keep their home language as well. Janet: Yeah, it’s important that they’re literate in both languages and are able to keep … Being bilingual is such a great skill to have. Isabel: Yeah, I agree. Yeah. 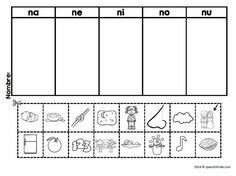 Janet: In your state, is there any bilingual teaching seal or what kind of teaching license did you need to get to work in a bilingual school? Isabel: Yes, it’s so funny because when I saw that question, the first thing that came into my mind was, “Oh my goodness, I’ve never thought of this before.” Because in Washington state, there is no requirement or credential just because dual language is still very new statewide for us. Isabel: Right now, there is no official credential for being a bilingual teacher. You don’t have to take any language test statewide. I think that there’s some districts, there’s one district who does do a language test, but in general, credentials for bilingual teachers in Washington state is very new. Isabel: Actually, this year at the University of Washington, I think in the summer time, they’re starting their first bilingual teacher education program. It’s not that it doesn’t exist, it’s just starting to get its feet just now. Janet: Yeah. I’m actually also in a state where they don’t have statewide credential that you need to be a bilingual teacher. Many of the districts in the interviewing process have language tests, but besides that, there’s nothing, a bilingual seal, but I know, I believe California has a bilingual seal and maybe Texas. I’m not sure. Isabel: Right. I personally, honestly, now that the university, they’re starting to get on their feet with bilingual education, I would like to go back just because I think that it would be so valuable to have more knowledge about bilingual education because without that credential, I personally as a bilingual teacher am every day searching for best practices and doing that research and to be able to go to a program where all of that is in one place for you and presented to you. I just think it’s so valuable. Janet: Yeah, I think that’s so true because so many teachers like we said stumble upon a bilingual or immersion education and we didn’t even really know it existed and then in the programs and our education classes since we were just studying the general ed classes or the general teacher classes and not something specific for bilingual teachers, we didn’t get those fundamentals so we can be a great benefit to our student. Isabel: Yeah, it’s like missing a whole other … Sometimes I tell my partner teachers, “It’s like missing a whole other side of you. You teach in English, but then you switch to Spanish.” Teaching in Spanish is not just translating everything from English. It’s a completely different language with a different culture. Isabel: I feel like as a first year teacher especially that’s an area that I’m really trying to develop in myself because I feel like I was so heavy on the English side and my credentials. I feel like I’m constantly trying to look for professional development in Spanish that’s authentic. Janet: Yes, exactly. You mentioned you’re a first year teacher, what was the interview process like to get your position? Was there any, what was entailed? I guess. Isabel: Right. It was funny because I actually interviewed at two separate districts because there are a couple districts in my state that do bilingual education. The differences were very stark to me. The first district that I interviewed at, they had eight principals in a room that was a panel interview and half of the questions were in English and half of them were in Spanish. Isabel: Then I did a written portion in Spanish as well. It was a very intense environment for me because I was not expecting so many principals in one place, but for Washington, because there are schools that are dual language, but it’s not very common, the need for dual language teachers is so strong that a lot of times, they will have all the principals come to one interview just for one teacher to try to get that one teacher into their school, but that wasn’t actually the district that I ended up going with even though they were wonderful. Isabel: My school that I interviewed for was also a panel interview, but it was the principal, the ELO facilitator and then some teachers who were going to be on the same team as me. They also did half of the questions in English and half of them in Spanish as well. I just really liked the idea of having other teachers that were going to be on the same team as me there because in bilingual education, collaboration is just such a wonderful thing to have. All of my interviews were panel though for both of them. Janet: Okay. Then there was no sample lesson or anything like that required? Isabel: No, there was not. Yeah. There was no sample lesson. I did bring previous lesson plans and unit reviews of what I have done in my student teaching that they were able to look over as well. Janet: Yeah, here in Minneapolis, I think it varies district by district. Some of the districts do like you mentioned, a panel of principals because they have several elementary schools and then other schools do just like the principal and a few teachers, maybe the social worker and then on a lot of them, they require you to push into a classroom and do a sample lesson which is kind of [crosstalk 00:11:13], but yeah, I’ve done that a few times. Janet: It’s odd, but you’ll get over it. Then some of the districts also have language tests to see which language test, in addition to doing half the interview in Spanish, half in English, they forget what it’s called, but some proficiency test that they … an oral proficiency test to make sure they can, that you are at a [inaudible 00:11:39] level in Spanish. I guess it [inaudible 00:11:41] from place to place. Isabel: Yeah. I’ve never taken one of the proficiency tests, but I’m always so curious. I would love to take one just because I’ve heard from friends that they actually categorize your language and your strength where you scored higher. I’ve never taken a test like that before and I would just be interested to see where I would land on there. Isabel: Right, yes. Develop. Mm-hmm (affirmative). Janet: Let’s see. For your student teaching, you said you were just general ed, did you teach your student teaching in a bilingual classroom or that was just in the only English classroom? Isabel: Yes, I did end up teaching my student teaching in a dual language classroom. It was actually also third grade which was such a wonderful blessing for me because I was able to take everything that I knew from my student teaching and to my first year of teaching. 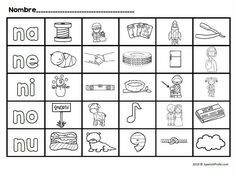 In dual language, you have to make so many resources. Isabel: It was so nice to be able to have a mentor alongside me, showing me the resources that she had, then starting to build my own in my student teaching and really be able to use that as a foundation as I moved into my first year of teacher. It was also a 50-50 model for my student teaching. I was able to get used to the switching back and forth throughout the day with languages. Janet: Well, that’s nice that you are able to stay in the same grade level for your, from a student teaching and your first year. Isabel: Yes. Especially for dual language. I’m not sure what I would have done if I was put into fifth grade or something. Janet: Yeah. There’s a lot of things to resources to create and things to translate and figure out especially content-wise and then even classroom management wise. Janet: Tell us, do you have any advice or tips for new bilingual teachers? Isabel: Yeah, I think that the greatest tips that I can give is just finding the people in your building who are willing to mentor and share with you their experiences and their resources. In my building, I am so blessed to be able to have many very experienced dual language teachers who have been willing to take me under their wing and just show me what they’ve already created. Isabel: Also, being at a school where that saved their resources so that future teachers are able to go back and look through what’s already been created because I think especially the first year teacher, it can be so overwhelming to look at curriculum and think of all things that you have to make especially for Spanish. Isabel: I think it’s so nice to feel like, “Oh, but I already know I can go to this teacher and see what she has in social studies or what not.” And just to be able to feel like you at least have a little bit to go off of at first. Janet: Yeah, it can be overwhelming. Definitely then for example, my first year of teaching, they give you all the curriculum, books and everything in English and then it’s like, “Oh, well you’re going to [inaudible 00:14:57] this in Spanish.” It’s not only learning what you have to teach, but then make sure you’re using the correct vocabulary and what not in Spanish in your lesson when you’re teaching. Isabel: Yes, yes. I’ve had many times where I’ve just asked some of my partner teachers, “Would you just be able to look over this anchor chart or this resource that I’ve made for my students?” Just to make sure that I’m using the right vocabulary or even sometimes the tenses if you want to teach a certain grammar lesson. Isabel: I grew up speaking Spanish, but there’s many times that I’m not sure of the reason for a grammatical rule in Spanish. 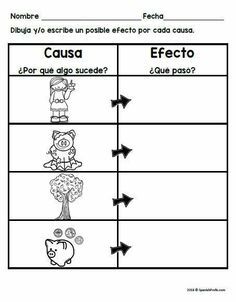 It’s so nice to be able to go to an experienced teacher who has taught it and then, “Why do we use this verb tense?” Or, “Why do we do this in Spanish?” To make sure that I’m able to clearly communicate and teach my students as well. Janet: Yeah, that’s so nice. It’s so nice that you have people, other teachers that you can work with and collaborate with your collegues. On your Instagram account, I saw that you are planning and collaborating with your team it seems on different integrated subjects? Can you tell us a little bit about that? Isabel: Yes. I would love to. I came into third grade and I have a team of let’s see, there’s two classrooms of dual language and then there’s two single language classrooms, but the whole third grade team works together. Every year, they do a Pacific Rim unit. Put all countries around the Pacific Rim since in Washington, third grade classrooms do world geography for their social studies. Isabel: There is the Pacific Rim unit that the teachers have done every single year the students get to basically race around the Pacific Rim by gaining points and finishing little social study tasks. I was thinking about how little time I had in the day to be able to allocate time to writing and social studies and map and reading. Isabel: I was just thinking how I also had an informative writing unit coming up at the same time as the Pacific Rim unit and how it would be so much easier to just have my students do informative writing on the Pacific Rim instead of allocating time to social studies and writing, I could just chunk it into one block and be able to give my students time to really dig deep. Isabel: My team and I created a unit where students would race around the Pacific Rim, gaining points by doing social study tasks, looking up words such as country and border, gaining vocabulary around geography. We also moved into note-taking on different countries around the world and they were able to choose a country in the Pacific Rim that they took notes on, researched and then we then turned that research portion into an informative essay. Isabel: We were able to nicely pair it with our informative writing curriculum as well. It was just really nice to see my students be able to have more time to dig deep and apply their knowledge of informative writing to the content area of social studies. Janet: Did you find that the students were more engaged or enjoyed it more because they were able to deep dive, learn a lot in various subject level areas? Isabel: Yeah. I definitely felt like there were moments where I was able just to stay in my room and watch for 10 to 20, 30 minutes at a time as my students were able to independently and in groups work on their content. I think something that really helped is that I created a website, a Google site of resources where my students could go and they were Spanish resources of course where they could go and research their country and just being able to give them tools to do research independently was really cool to be able to have that as a week long goal. Isabel: Students didn’t have to rush and think, “Oh, I have to finish this today.” But because we had the time, they were able to really dig deep and apply their knowledge. Janet: Yeah, it’s so nice when teachers are able to take even a few days or a week to focus on different lessons because I think students are able to engage more in what they are learning and enjoy and actually take control of their learning it sounds like and be excited about what’s happening in the classroom and not just like you said finishing a paragraph and turning it in. Isabel: Yes. It was nice to be able to have something that just they knew that over the month of this unit that everything connected to each other. That it wasn’t just isolated lessons on here’s how to create a paragraph, here’s how to graph the main idea of an informative text, but that everything they were doing was culminating into a report on a country that we then did a banquet for. Isabel: It was something that they knew they could look forward to in the future. Every task that they did actually had a purpose for them. It also increased their engagement in that way as well. Janet: That sounds great. Now, can you tell me how your third grade team, you said you collaborate quite a bit. Do you guys have a shared planning time or how does that work? Isabel: Yes, we do have a shared planning time. Every day, we have … When your students go off to specialists, that’s our planning time. The whole third-grade team all has specialists at the same time and every week, we have I think … Yeah, on Thursdays, we have a time where we come and we make time to meet together, but even if we’re not meeting on Thursday, it’s so nice to know that if I just have a question or if we need to talk about something really quick that I know that my teammates are available at the same time as me that’s not a time after school or before school, but it’s during the day. I know that they’ll be in their classroom. Janet: Yes. Okay, great. I think that’s all the questions I had for today. Where can our listeners connect with you online? Isabel: They can connect with me on Instagram. My handle is duallatina and I try to post frequently about what I’m doing and I love to share and see the resources of other bilingual teachers too. Janet: Great. Well, thanks so much for coming on the show. Janet: Thanks for tuning in. If you are a busy bilingual profe, love to hear from you. Head over to bilingualprofe.com to connect with other bilingual educators just like you. See you next time. Bye bye. Enjoy the podcast! 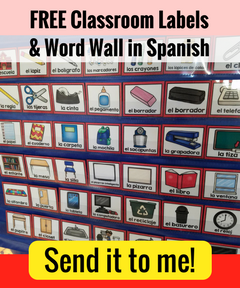 We hope it gives you some ideas for your Bilingual, Dual Language or Spanish Immersion classroom. Feeling overwhelmed? 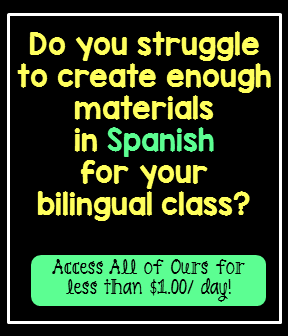 Get instant access NOW to over 300 resources in Spanish for Pre-K through 2nd grade bilingual and Spanish immersion teachers for less than $1/day? 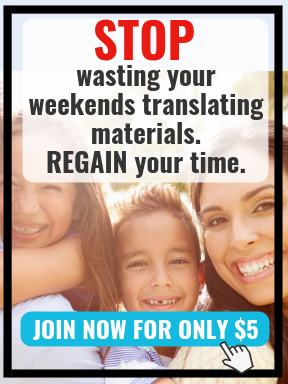 Try Profe Club for only $5 and start feeling more prepared TODAY! Connect with Janet on Social Media! !